Vancouver, BC - March 13, 2019 - Since Geoscience BC was created in 2005, we have generated and compiled thousands of square kilometres of geophysical data to help visualize the earth beneath our feet. Now, practicum student Matrika Koirala is auditing the data to make sure it is easy to access through our Earth Science Viewer (ESV) online mapping application. Koirala is completing the final semester of an advanced diploma program at the British Columbia Institute of Technology (BCIT). Prior to enrolling at BCIT he worked as an engineering geologist in Nepal and completed a Masters project looking at landslide hazard mapping in Nepal. 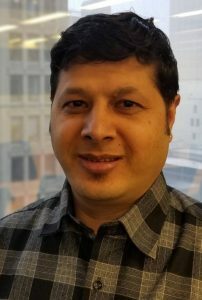 "Right now, I'm working through a year-by-year audit of Geoscience BC projects to make sure that all of the geophysical data in reports is also available on the Earth Science Viewer," said Koirala, "If I find missing data, I use ESRI ArcGIS software to compile the data and make the data available on the Earth Science Viewer so it is easy for people to access online." Koirala is supervised by Geoscience BC GIS Specialist, Ron Prasad, who manages the databases behind the ESV. "We have a vast amount of scientific data that we strive to deliver to the public in a reliable, simple and efficient way," said Prasad. "Matrika's work is essential to make sure that everyone from communities, government and industry can find what they need on the Earth Science Viewer." Once his practicum is completed, Koirala hopes to find geology-related GIS work in British Columbia where he can apply his new skills to other projects. Geoscience BC's Earth Science Viewer is an online tool that consolidates all project and report data published by Geoscience BC.